Athleisure lines have quickly taken over both the fashion and fitness industries as a cultural shift continues to occur in the way women dress. As of late, women are trading denim for leggings as they hit up bootcamp classes before taking on the office. One fitness e-comm, Carbon38, has taken the athleisure trend to luxurious heights with a brand new collection launching on December 1. Each item within the collection is priced at $100 to $300. The line goes beyond the expected sports bras, leggings and zip-ups to include dresses, jackets and jumpsuits - enabling female powerhouses to literally do it all without pausing for wardrobe changes. Spearheading the launch are such powerhouses, Carbon38 cofounders Katie Warner Johnson and Caroline Cogolak. The two former ballet dancers met when they were 15 years old and went on to attend Harvard University together. In 2013, they joined forces to launch a company featuring exactly what they know best: active wear. The site's models are all actual fitness professionals who portray exactly what the clothing looks like on strong, active bodies. Using these toned, athletic women for the shoots in lieu of professional models increased the weekly sell-through rate by 40%. Clearly Katie and Caroline know exactly what their target consumers are looking for. Now, they're taking their expertise to the next level with the launch of Carbon38's very own fashion collection. 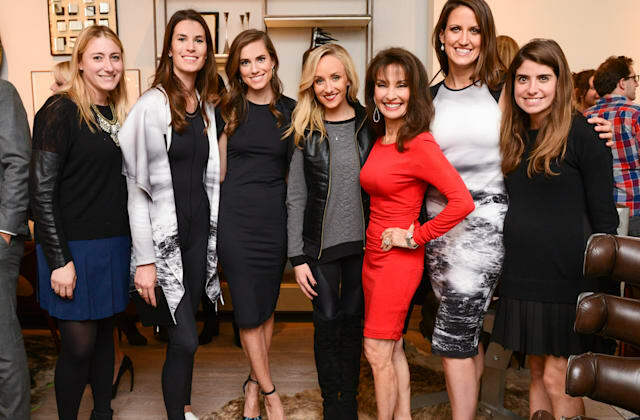 On November 10, the ladies hosted a launch celebration at a private residence in SoHo, NYC. Katie, Caroline and top fitness instructors from Tracy Anderson, Soul Cycle, SLT and more sported staples from the new collection for guests including Allison Williams, Nastia Liukin, Lauren Remington Platt, Dylan Lauren, Susan Lucci and the Principles of the New York City Ballet to peruse while sipping on cocktails. While Caroline showed off the athletic side of the line in a neoprene parka, skin-tight jumpsuit and sneakers, Katie sported a figure-hugging neoprene dress and heels, proving the collection's immense versatility. Williams wore a Carbon38 athleisure dress and blazer from the new collection while Liukin wore Carbon38 product from head to toe. Click through the slideshow above to see pics of the Carbon38 launch celebration and staples from the collection! Amidst drooling over the gorgeous apartment and people-watching over a delicious spicy margarita by BE MIXED, we were lucky enough to catch up with Katie and Caroline at the intimate launch celebration. We discussed why Carbon38's is so different from other athleisure collections, the biggest challenges the women faced while putting it together and where they plan to take the brand five years from now. What inspired you to launch this new collection? Caroline: We really think that there's this new woman. She's a mother, she's an entrepreneur and she loves to work out so it's really that active wear that takes her from her gym to her work meeting to her dinner to her lunch. We're really focused on that athleisure look. What makes this collection different from other athleisure collections that are out right now? Katie: We've always just listened to our customer from day one. She's our compass in all things and we found that she's this professional woman, an executive, a wife and a mother who wants to live forever and look hot. That extends beyond just the hours that she spends at the gym. So we wanted to really look at what she's actually doing every day. A big part of her day is going to work so we looked at silhouettes that we could take all the things we love about active wear, the fabric, machine-washable, chafe-free, comfortable and apply them to ready-to-wear silhouettes. We also wanted to pepper in some really premium basics. We didn't want to overlap with the vendors we have on our site because they're everything to us and we don't want to compete. What was the biggest challenge you faced creating a line that enables you to go from bootcamp to brunch? Caroline: It's active wear fabrics and constructions and ready-to-wear silhouettes. The challenge is building the infrastructure to do that, and we have an amazing team of people in L.A. who have that experience. It's fantastic to see this product come to life so it's very exciting. Do you have a favorite staple piece in the collection? Caroline: I love my neoprene parka that I'm wearing! Where do you see the brand going five years down the road? Katie: I think active as a lifestyle and wellness goes so beyond the gym. There are so many things this woman and customer needs support with whether it's nutraceuticals or what fitness class to take or what footwear to wear beyond the gym. We're dabbling with a bit of a content site because we can allow all of our ambassadors who are our models and who are fitness professionals to share their stories and their insight so that the customer can be further fed with information to be able to make the right choices for her in her life. We also want to make the purchase easier so we're definitely working on bringing our brand offline. We want to figure out ways to get the brand to the customer in really organic ways so we're utilizing our fitness instructor network. I really think that true innovation and e-commerce in general isn't going to come on the product side, it's going to come on the distribution side so we're definitely pushing the envelope on that.